If you haven’t yet seen the Proenza Schouler PS1, you must be cut off from the fashion world because this baby is a top pick this year and I’ve seen it everywhere. Coming in a variety of colors, you’ll be sure to find one that suits you. If you have more of a simple, basic look, go with a black one or beige like the one pictured above. 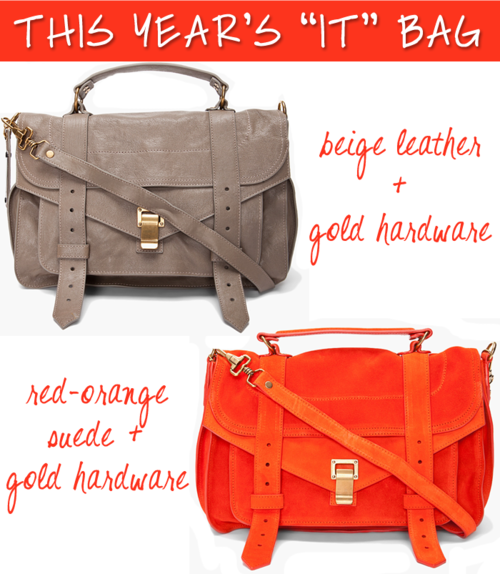 For those of you with a little more edge, choose a bright hue like this beautiful red-orange suede. There’s a color for everyone and the bag is super functional with numerous pockets. Get yours today or add it to your Christmas wish list! Find these two pieces and other colors at SSENSE!